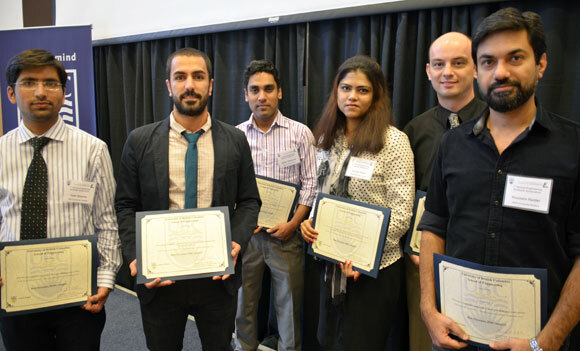 Winners at the first-ever engineering graduate student symposium are: Yash Sharma, Hamid Reza Zareie Rajani, Kader Siddiquee, Nilufar Islam, Tim Abbott, and Husnain Haider. A group of graduate students at UBC’s School of Engineering did a bit of show and tell at the university recently. The students organized the first-ever graduate symposium, a student-led event that allowed 38 master’s degree and PhD students to explain to the community, the university, and their peers exactly what their research entails. The event consisted of three parallel sessions, each showcasing the work of graduate researchers. The students had no more than 12 minutes to make their presentations, and prizes were awarded in both the master’s and PhD categories. "We organized the symposium as a means for graduate students to share their research with a wide audience both within and outside the School of Engineering,” says student Tim Hurley, a PhD candidate in civil engineering. Hurley, and fellow organizer Nilufar Islam, say the students were judged on their presentation, the methods of research, progress or results, and professionalism. Islam, also a PhD candidate, says it was rewarding to see a mix of academic, industry and other local talent together and learning about the type of work that goes on in UBC’s engineering labs. Organizers invited James Kay, regional manager at Kelowna’s Focus Corporation to speak to the group and he talked about how to develop your career during your first years after graduation. “Student presenters shared their work on a variety of topics in civil, mechanical and electrical engineering,” says Islam. “I know that the students gained valuable experience and enjoyed the chance to share their expertise and passion with all those in attendance." 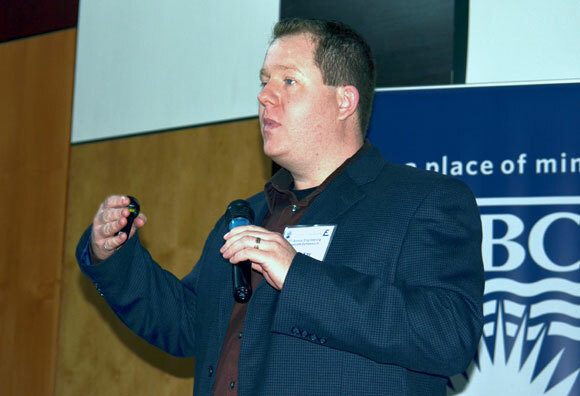 Regional manager at Kelowna’s Focus Corporation, James Kay was the keynote speaker at the grad student symposium and his topic—the first three years after graduation, how to develop a strong career as a consulting engineer—resonated with the students.